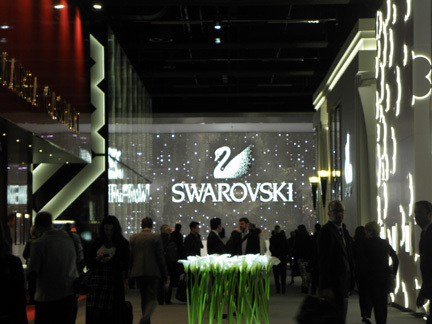 Few journalists have the incredible experience of visiting BaselWorld Fair for nearly 30 years. It is an enlightening and always-changing journey. 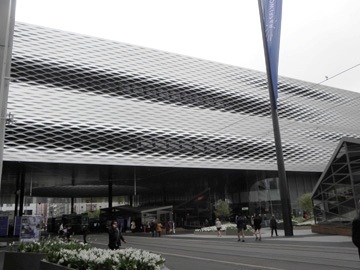 This year’s BaselWorld, we witnessed the third major change of the fair in three decades. Years ago, it was simply a Swiss industries fair. 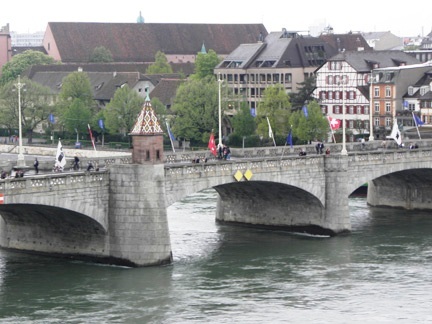 Then it grew, many industries left the fair and it became Basel – complete with watch brands and jewelry brands from around the world. Then it grew, and the layout of the fair changed, with many more brands coming on board, more halls opening up and a bit of chaos in terms of layout and design. A clear winner for new pavillion: Swarovski, which built their design around the cone-shaped center opening of the new fairground layout. Then it grew – bringing us the changes of today. The fairgrounds have been totally remodeled to enable larger exhibition booths. Except the word booth, or the more recently coined term “Stand,” simply do not do the fair justice. In fact, inside the huge exhibition space, most top brands have two- and three-story tall pavilions in which to showcase their wares. Several of the top spaces were designed by award-winning architects and warranted press conferences of their own during the show. The new Citizen pavillion was truly intriguing — thin wires with thousands of brass baseplates attached for a walk through an enchanted forest. Hermes enlisted a top Japanese architect to design its garden-like pavillion. away with its intimidating guards at the door. It even gave sister-brand Tudor almost equal space. YES there is still an outside, although immediately outside is covered with a walkway from one hall to the other, that features a large cone-shaped metal opening in the middle. YES the bars are still there – and more restaurants, too. Severely lacking: bathrooms – the Fair demolished two bathrooms at the foyer entry and folks had to leave a 15-minute gap in their day just to visit second- and third-floor facilities. While this may sound like an odd thing to be writing about—it was probably one of the most talked-about issues at the fair! 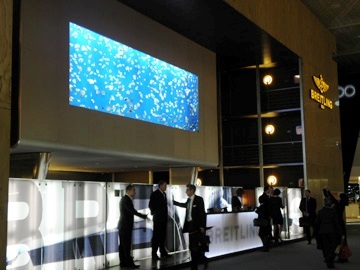 While in a different location, Breitling nonetheless brought along its huge aquarium. 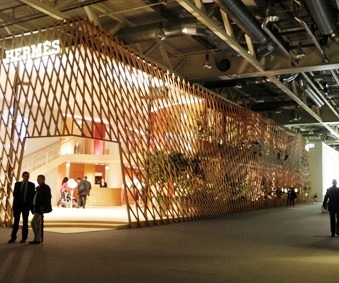 The new walkway across the BaselWorld exhibition space — filled with two floors of exhibitors. press conferences and the alternative exhibition spaces. I had thorough appointments with more than 100 watch brands — sometimes making things a bit of a blur. But it was all worth it. 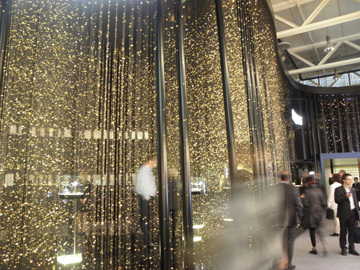 As you can see by the past 10 days of posts and by the upcoming news and trend stories – BaselWorld brands did not disappoint in creativity, boldness, newness and complexity. Stay Tuned.